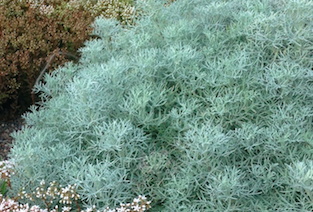 Lovely, soft gray curls make up the foliage of this low spreading perennial. Easy to grow and long lived plant for full sun and well drained soil. Little summer water when established. Takes the hottest aspects with aplomb and remains good looking all season. At the end of summer stems extend to produce small white flowers. Not really showy but it expands the overall texture of the plant. Completely winter deciduous. Cut back hard in early spring. Forms woody stems at the base and is a quite permanent plant. Flows in and around other plants gracefully. Moderate deer resistance. To 1′ x 3′ in a season.